Quilting Adventures: Happy Anniversary Fibre! Wow! 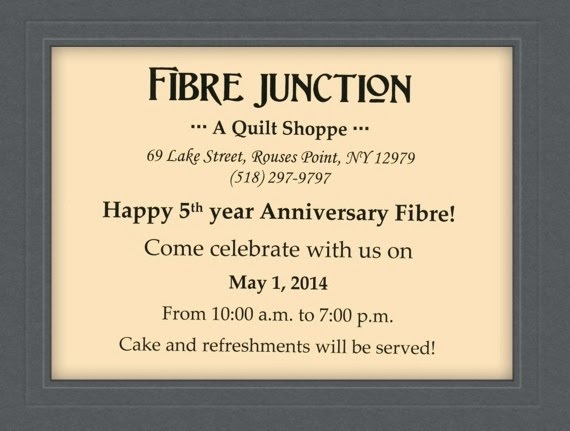 It's hard to believe that Fibre Junction has been opened for 5 years! How time flies when you're having fun! Let's celebrate by having a give away! I'll put a little package together! Leave a comment by May 3, 2014 and you're in the draw! For online orders please enter the word "5Years" in coupon section and we'll pick your discount for you! Shipping charges will be calculated on total amount prior to discount. Sale ends May 3 at 12:00 a.m Eastern time. Thank you so much to all that have made this celebration possible. *Discount applied at time of transaction and on in stock items only. One discount chance per transaction. Not applicable on prior purchases, gift certificates, BOM, magazines, classes/clubs and already discounted items. All sales are final! Bonne Anniversaire, Carole c'est toujours agréable d'aller passé un moment à magasiner de très beau tissus à ta boutique. ça fait un moment que suis allé cause santé, mais je me propose de passer bientôt. Happy Birthday! And ya know...if I win, the goods could be delivered in person. Just sayin' LOL! Wow....time flies. It seems like only yesterday we were reading about the birth of the adventure. Happy birthday/anniversary! Congratulations on the 5 year mark, it is good to see small businesses making it in this economy. Someday I have to plan a trip your way, would love to paddle on the lakes. Hi, Chookyblue tells me you are having a birthday. Well done on your 5 years, and enjoy your celebrations. Happy 5th Birthday!! So glad that your shop has been a success! Cannot believe it has been five whole years already! Congratulations on all your great achievements in such a short time. Happy Birthday, Carole. So sorry we missed your celebration. We are in NH at the Cross Stitch Show. Please save me a piece of cake!!! We will be in to see you soon. Wow, Carole! Five years! Congratulations! If only I lived closer. You'd have a difficult time getting rid of me! And here's to five years more!